Last June I decided I was going to knit my way through The Joy of Sox. I was doing really well and knocking the patterns out one by one until November. At that time, I started thinking about Christmas things. I’d also started a pair in the book that were just totally tedious. So I put them aside for awhile. Now, I’ve decided it was time to get going on the book again. The socks have been set aside for awhile, and now they don’t seem nearly as tedious. They are not a quick knit by any means, but I am enjoying them again. I am still not a huge fan of purling in the round, but it’s ok, and this is such a pretty pattern. 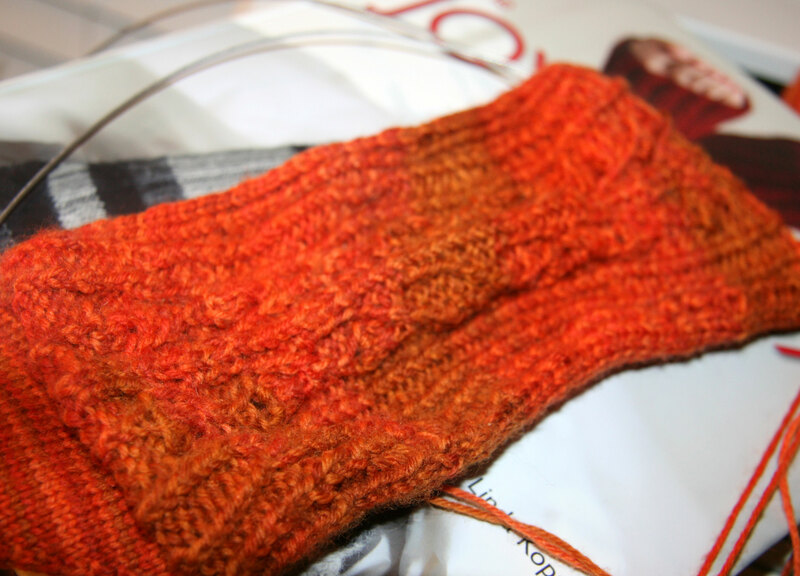 I am almost to the heel of the first sock. It’s a toe-up pattern. This is a terrible picture, but it gives a small idea of what the sock will look like. 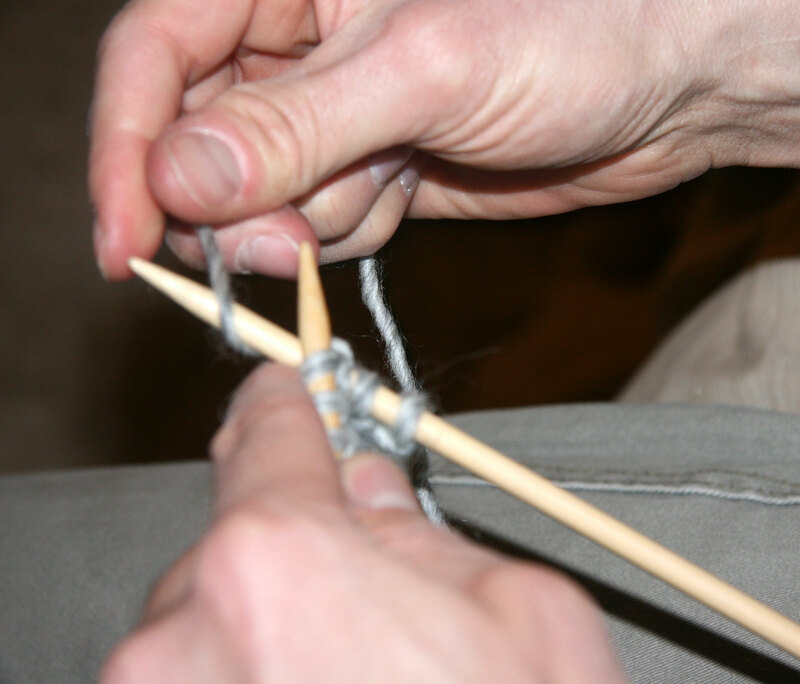 An even greater “joy” in knitting is that David finally let me teach him how to knit. He’s really taken to it. His garter stitch already looks perfect and even. It doesn’t surprise me. He’s doing his first scarf. (He is calling it a potholder currently.) 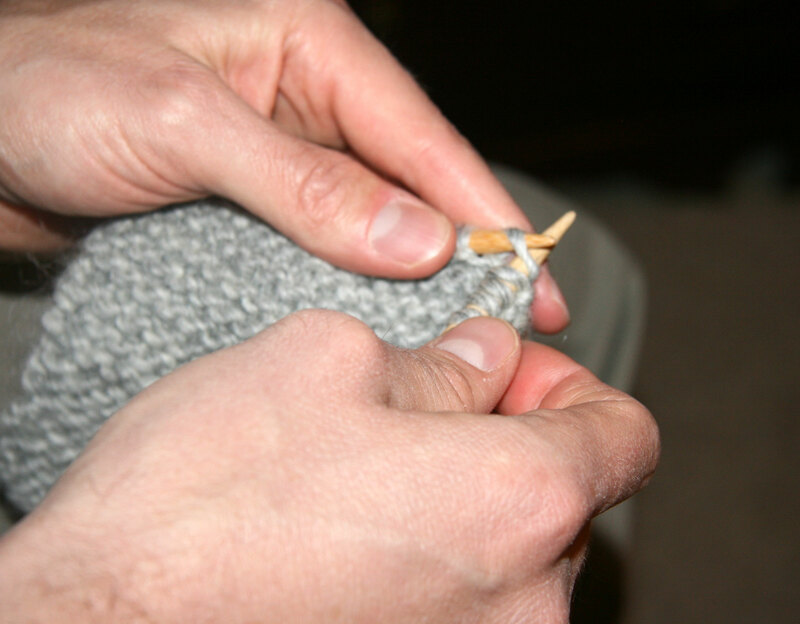 He is using size 10 needles and is knitting with gray Lamb’s Pride yarn left over from his sweater. I have a few skeins of it left. And here comes T-R-O-U-B-L-E in the form of little Davey. He grabbed yarn and was ready to take off. His expression is just plain ornery! What he really wanted was the camera. So we let him go after it. He took this picture of Davey and me. Very goofy of me, but Davey took it so – it’s precious. Speaking of knitting – Davey is asleep, and it is time to go knit a little! This is great! Some of the best quilters in the US are men, and no doubt men make amazing knitters as well! His knitting looks very even–awesome job David! Good luck in your endeavor! That’s not a goofy picture of you! It’s adorable. Once he gets addicted, he’ll understand the need to knit. Ditto on sharing your stash… or it would be an opportunity for him to get his own! Twice as much yarn. That’s so cool that David is knitting! And I’m so impressed that you’re continuing your sock journey. Nice work, David! is he going to want his own knitting blog?